6 Rolls - Prairie Horse Supply Medical Athletic Tape Wrap bandages are known around the world as the preferred self-adherent bandaging tape for medical professionals, athletes and athletic teams. Originally made to bandage horses, now available for people. It is a must have supply, stock up with some fun new colors. It is easy to cut or tear, and a wonderful all-around medical wrap. 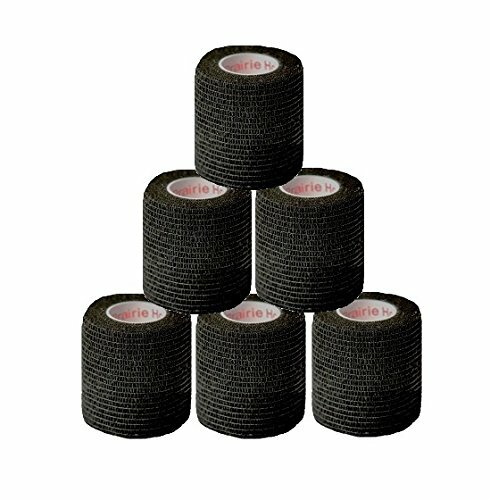 These elastic bandages are strong and provide excellent support. The bandage applies pressure to inhibit bleeding. It is also flexible enough and when used properly with padding it will not cut off circulation. One of the most exciting features is that it adheres to itself so no clips or fasteners are needed. Highly popular with Soccer players, helps to identify teammates. Listing for 4" Wide x 5 yards long when stretched, also available in 3" and 4" wide sizes. 6 Rolls of Self-adherent medical bandaging tape, no clips or pins needed and will not stick to hair or skin. If you have any questions about this product by Prairie Horse Supply, contact us by completing and submitting the form below. If you are looking for a specif part number, please include it with your message.